With its ceaseless tide of wizards, Wargs, Orcs, Stone-Giants, Skin-changers, Goblins, and, of course, Gollum, Peter Jackson's The Hobbit: An Unexpected Journey - available on Blu-ray from April 8 - is a feast for fans of fantasy filmdom. But it proved a challenge of Silmarillion proportions for the visual effects team at Weta Digital charged with bringing Tolkien's fantastical romp to life. The first blockbuster to combine the dimensional hurdles of 3D and pioneering 48fps HFR technology, it's arguably the most daunting special effects movie ever attempted. "Yes, there was a lot of work involved," says senior visual effects supervisor Joe Letteri, with alarming understatement. "We did around 22,000 FX shots for The Hobbit. That compares to 18,000 for LOTR: Return of the King. The scale of these films has evolved considerably..."
At least Weta's Herculean efforts have been appreciated. Not only was the movie a box office smash, it received award nominations from both Bafta (Letteri's reason for visiting the UK) and the Academy Awards (plus numerous genre trophy nods). The Hobbit may have been cruelly beaten at both by Life of Pi, but Letteri is sanguine: "Awards aren't what drive us," he smiles. "The number one thing on your mind is just getting the movie finished on time!" 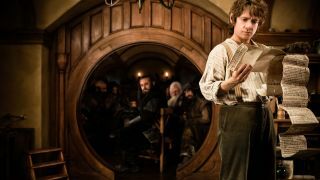 Letteri tells TechRadar that the decision to shoot The Hobbit in stereo significantly added to the complexity of the project, requiring a fresh approach after the original trilogy. "A lot of the things we got away with on Rings, such as the miniatures, proved a lot more difficult to do in 3D," he confides. "It's possible to use miniatures but the scale, mood and lighting is tougher to pull off. In 2D, it's easy to manipulate individual elements, but in 3D the perspective tends to break." The most challenging sequence to create in 3D proved to be the opening skit in Bag End. "In the original trilogy, we did the perspective gag very traditionally," says Letteri. "We brought Ian McKellen's Gandalf closer to the camera and pushed Elijah Wood's Frodo further back to make him small. But in 3D that doesn't work. (Director) Peter (Jackson) wanted to do a shot similar to that in Fellowship, but this time with Gandalf walking around Bilbo and 13 dwarves – it's all very crowded and they're walking through each other. "The only way we could shoot this in stereo was to use two cameras slaved to each other across two sets, the Bag End set with the dwarves, who were all choreographed and knew their marks and lines, and Ian McKellen on a green screen stage right next door. He had C-stands representing the other actors. "The camera operators were on the Bag End set following the action, and this was driving a motion controlled camera on the green screen set following Ian. Peter could see both combined together in his monitor." Letteri reveals that the minute long scene took just four takes to shoot, but needed a year to knit it together. 3D aside, the most contentious and innovative film technology used to make The Hobbit was HFR, which doubles the number of frames (from 24 to 48) to give a clearer, smoother picture. Not only did HFR fundamentally change the look of the film, Letteri says it also transformed what Weta could achieve with CG animation. "It really helped us creatively," he explains. "For very fast motion, and Gollum's rapid fire dialogue, we found we could really sharpen up movement. "If you look at that cave scene with Gollum, that's the biggest pay off for us creatively, that's where it all came together. Because there's less blur you perceive detail all the way though - you really pay attention to the nuances of Gollum's facial animation." Letteri says that it's this realisation of digital acting that stands out as The Hobbit's crowning FX achievement. "Gollum was our one speaking character in the original LOTR; sure we also had Trolls, Uruk-hai and Orcs fighting battles but they really didn't have to deliver lines. In The Hobbit, in addition to Gollum, we have five other speaking digital characters. "We've brought creatures off the page as Tolkien described them, in a way that ten or twelve years ago would have been almost impossible. The fact that Peter Jackson can write a nine minute scene with an actor and a digital actor together (the Riddles in the Dark scene) to me is a great testament to what you can do with the art form these days." If you want to learn more, pick up The Hobbit Blu-ray says Letteri. "We go into deep detail about the visual effects," he enthuses, "really breaking down how the characters were created. Fans will get to follow the thought process that goes into the overall design through to how we created the final shots for the movie." And what of the future? Joe Letteri doesn't believe the evolution in film making technologies is going to slow down any time soon. 'There's always going to be more we can put into the image," he says. He almost seems to be relishing the long nights ahead. The Hobbit: An Unexpected Journey is released on Blu-ray April 8.